"That’s mine!" shouted Rachel. She reached over and grabbed the doll from Megan’s hands. "You can’t play with it! It’s my toy!" Megan felt the doll being pulled out of her hands. She stood still, staring at Rachel. A tear ran down her cheek. "Share," she gulped. "No! It’s mine," Rachel scowled and turned her back to the other girl. Megan, realizing she wasn’t going to get to play with the doll anymore, looked around for another toy. She saw some building blocks and sat down in front of them. They were painted bright red, yellow, green, blue, purple and orange. She started stacking them up high, making a big tower. She had just put a purple one on the top when Rachel came over and kicked the block tower over. Blocks flew across the room. "Those are mine! You can’t play with them!" she snarled. She threw the doll across the room and started gathering the blocks into a huge pile. She wrapped her arms around them and wouldn’t let Megan touch them. Megan stood up and looked at the blocks. She’d spent so much time building that tower and now it was broken to pieces. She burst out crying. "What’s the matter, Megan?" her mum asked, walking over to her. Through the sobs, she replied, "Rachel broke my tower. She kicked it down and won’t let me play with the blocks any more." Her mum looked over at Rachel. She sat on top of the blocks, guarding them. "Rachel, won’t you share your blocks with Megan?" she asked. "No! They’re my blocks. She can’t play with them!" Rachel said angrily. "Well, Megan, you can play with the doll. See it over there?" her mum pointed. Just then, Rachel jumped up and ran over to the doll. She grabbed it and ran back over to the blocks. "It’s mine!" "Oh, Rachel, that’s not very nice. You need to share your toys with the other children. They share their toys with you," Megan’s mum reminded. Rachel didn’t budge. She sat still and refused to share. "Come on, Megan. I think we need to go home. Rachel’s not sharing her toys," her mum said. Soon, she and Megan left. Rachel sat on her toys for a while and then dropped the doll. She was all alone. Her mum was busy in the kitchen and now she had nobody to play with. "Where’s Megan? Her mum asked. She’d come into Rachel’s room to check on her. "Did she go home?" "Yes. She went home with her mum," Rachel said. "Why did she go? I thought she was having fun with you? Don’t you like playing with Megan?" her mum asked. "These are my toys, not Megan’s. I don’t want her to touch any of them," Rachel answered. "Well then, Rachel, she’ll not want to come over and play with you any more. If you can’t share, then you’ll have to play alone," she explained. Rachel spent the whole day playing in her room by herself. 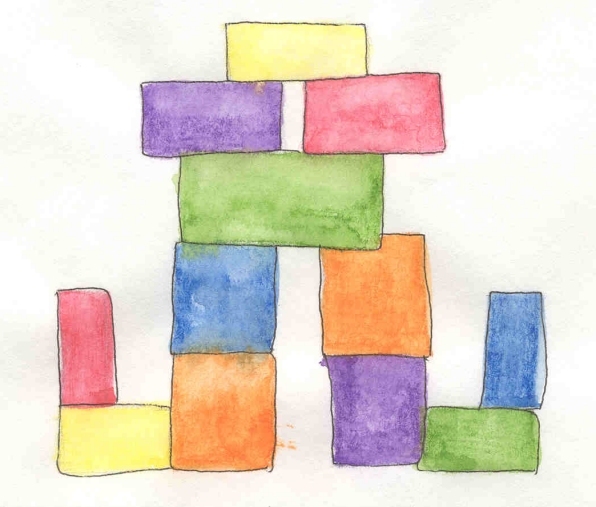 She built a castle with the blocks, but there was nobody to see how tall it was. She tried to play dolls, but there was nobody there to play mummies and babies with. Soon she started to feel lonely. She wished that she had shared her toys with Megan and that Megan was still here. "Mummy, can we go to Megan’s house?" Rachel begged. "If you’d like," her mum answered. They walked next door and knocked. Megan came to the door. "I’m sorry, Megan. If you come back and play with me, I’ll share my toys with you," Rachel said. Megan smiled. "Okay, as long as you share. I’ll bring some of my toys over and you can play with them too." She ran into her room and grabbed her favorite toys and took them over to Rachel’s. They played together happily for several hours. When it was time for Megan to go home, she said, "That was fun. Sharing is fun." Rachel smiled. She was happier because she’d shared her toys and let Megan play with whatever she wanted. Megan had let Rachel play with some of her toys too. Sharing is much better!